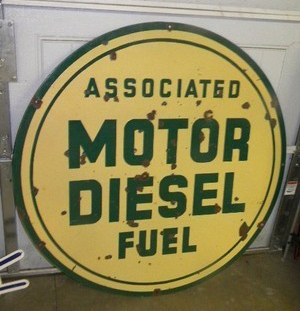 This Associated Motor Fuel sign measures 48″ in diameter. The Porcelain Sign is a light yellow with a green boarder. The green boarder is rather thick and has a smaller boarder within it. The text on the sign reads “Associated Motor Diesel Fuel.” This sign was made as both a double sided porcelain and single sided porcelain sign.